"Chiropractic refers to the practice of manipulating the spine to treat disease." The term chiropractic comes from the Greek words "cheir" which means 'hand' and "praxis" which means 'practice' or 'done by', and refers to the practice of manipulating the spine to treat disease. Chiropractors base their theories of disease on the connections between various body structures and the nervous system via the spinal column, and on the role of the spine in biomechanics and movement. Therapy is directed at the spine in order to modify the progression of disease. 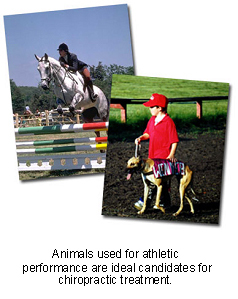 "Chiropractors who work on animals must have specific training in both chiropractic theories and animal anatomy..."
Chiropractors who work on animals must have specific training in both chiropractic theories and animal anatomy so that they are knowledgeable about the differences in biomechanics and neuromusculoskeletal function between humans and animals. In North America, a certification process is in place to ensure that practitioners possess the appropriate knowledge and skill to treat animals. The organization responsible for this certification is the American Veterinary Chiropractic Association, with specific designation of its members depending on their level of training, as follows: "Animal Chiropractor" is a Doctor of Chiropractic with AVCA certification; "Veterinarian Certified in Animal Chiropractic" is a DVM / VMD certified by AVCA; and "Veterinary Chiropractor" is both a Doctor of Chiropractic and Doctor of Veterinary Medicine. In some North American jurisdictions, certified Animal Chiropractors may be permitted to perform treatments without supervision; in other jurisdictions, chiropractors must be supervised by licensed veterinarians. The need for a referral varies by jurisdiction. "...chiropractors see the patient as a functional whole..."
Like many holistic practitioners, chiropractors see the patient as a functional whole, rather than as a sum of its parts. Ensuring normal range of motion of vertebrae helps optimize function of lymphatics, blood vessels and nerves, which communicate between the spine and various body structures, allowing the body to function optimally to the point that further interventions may not be required. Applied correctly, chiropractic adjustments can alleviate or eliminate the need for long-term drug or hormone treatments. The success of treatment depends upon the degree of pathology present and the duration of the condition. When performed by an experienced, trained veterinary professional, chiropractic manipulation is generally considered to be safe. If adjustments are performed with the appropriate force, the patient will require a series of treatments, which will gradually result in restoration of health. However, if the force of an adjustment is excessive or the adjustment is applied at an incorrect angle, time, or location, serious and possibly irreversible damage to the patient can occur. Temporary low-grade discomfort (lasting 24 to 48 hours) may be experienced in a minority of patients following chiropractic treatment. Can chiropractic be combined with other types of veterinary medicine? Chiropractic therapy is often combined with other forms of traditional and alternative veterinary medicine. "There appears to be a particularly strong synergy between acupuncture and chiropractic." There appears to be a particularly strong synergy between acupuncture and chiropractic. When multiple types of treatments are used, it may be difficult to determine the efficacy of a chiropractic treatment, unless the treatments are performed at different times. Certified veterinary chiropractors have the knowledge and skill to understand the interactions between different forms of treatment and to interpret the patient's response to therapy. If your pet is receiving chiropractic treatment from a practitioner other than your regular veterinarian, it is imperative that both individuals are kept updated about the ongoing treatment in order to provide coordinated care of your pet, to allow proper evaluation of treatment and to minimize any avoidable interactions or interferences. 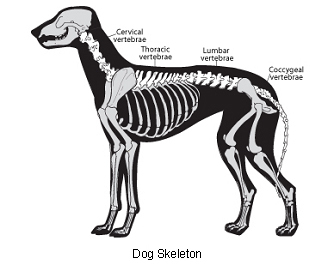 How can I find out more information about veterinary chiropractic?